If you haven’t figured it out by now, I *love* breakfast! We are big breakfast people. It is usually our biggest meal of the day, and then we taper off the portion sizes the rest of the day. And especially on weekends when my husband is actually home to eat breakfast with us, Saturday and Sunday breakfasts are a pretty big deal around here! This is one of my Sunday brunch ideas, although it is so fast to put together that it really makes for a great weekday, on the go breakfast too. You can even make up the batter the night before so you can just pop them in the oven while you get the kids ready for school. We have a wonderful, local source of pastured sausage and bacon, so I use that in these often. Ask around at your farmer markets for a source that pastures their pigs, supplements with non GMO and non soy feed, and does not treat them with antibiotics, hormones, etc. The nutrition content in pork that has been pastured is far superior to conventional. 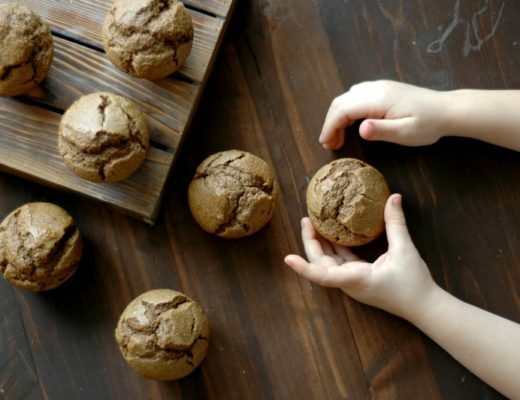 If you do not have a source near you, just load up these muffins with any veggies you want! I do that often when pork isn’t in our budget. 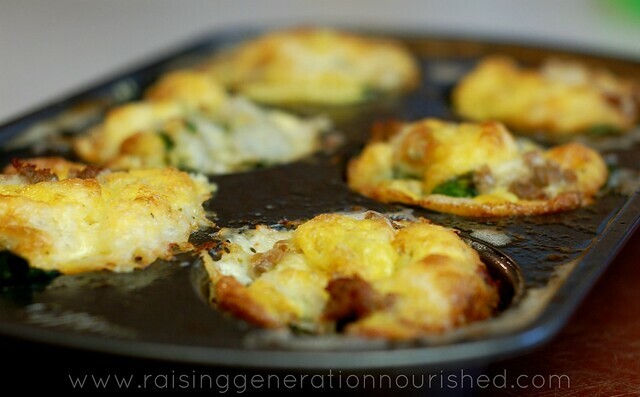 Egg muffins are a perfect way to make eggs ahead! They reheat well and pack well for lunches, too. ¼-1/2 lb pastured ground breakfast sausage Depending on how much sausage you want in the muffins. I do make my own sausage blend and add it to plain ground pork. Brown the sausage in some butter or coconut oil. Beat the eggs, milk, olive oil, baking powder, salt, and pepper in a small mixing bowl. 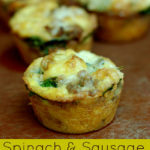 In a well greased (with butter or coconut oil) 6 muffin tin, divide the sausage and spinach in each cup. 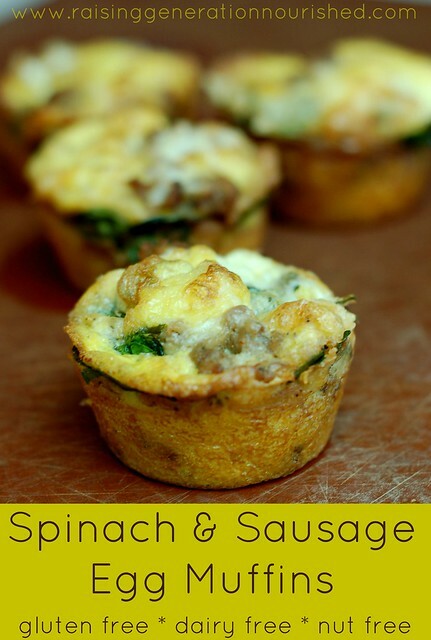 Pour the egg mixture over the spinach and sausage. Make the entire batter up the night before. Even get them into the muffin tin. Just cover it up and store in the fridge over night and you can bake them off in the morning. Most of the time I at least brown the sausage the night before. The batter comes together in less time than the oven takes to pre-heat so I do tend to just make it up in the morning! Double or triple up for a brunch crowd! Change up the veggies to what is in season! Zucchini in the summer, greens in the winter, asparagus tops in the spring! Don’t forget the kiddos! This is actually a great on the go breakfast to school! So tell me what you love planning on your weekend brunch menu! And keep me posted if you try the egg muffins! These look really, REALLY good. I will definitely be trying them. I love the portability of them, too! Great 🙂 Let me know how they turn out! These look fantastic! I want to try this recipe! Hi Haley! Yes you can! You can either freeze just the batter or you can bake them off and freeze individually. Hope that helps! I swapped out the sausage for about 200gms of mushrooms to make them vegetarian and cooked those up (chopped) in some oil before adding them to the muffin pan. 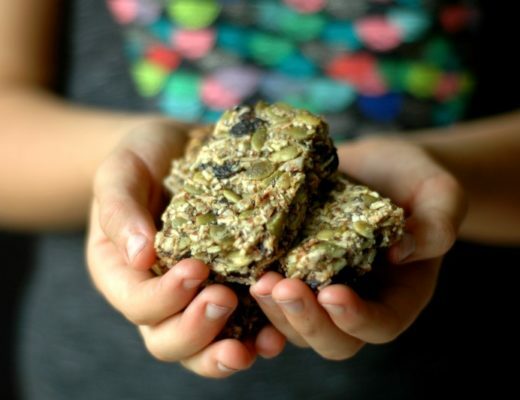 Great idea Mia – sounds so yummy! Could you substitute soy milk for the coconut? The hubby does not like the flavor of coconut milk much. Hi Virginia! Great question! I personally do not advocate for any soy products as per the Weston A Price Foundation soy is quite toxic and dangerous in most forms unless non GMO and fermented. I am happy to link some sources if you wish on that too 🙂 There isn’t a whole lot of milk here – if you are dairy free and don’t like coconut milk, I would suggest either almond milk or even just water would probably work in this recipe. I hope that helps! Looks like a great way to start the weekday! Thanks for sharing this recipe. WE are having this for lunch today, and it’s fantastic! I did it in a big instead of a muffin tin, and I quadrupled the recipe for a 9 x 13 pan. We used Daiya pepper jack cheese (about 1/4 of a cup for the quadrupled recipe was a good amount). YUM!!! Love egg muffins! 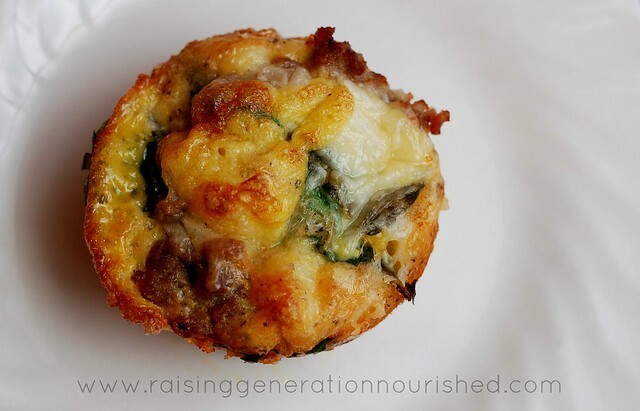 They’re omelettes in a muffin shape! What is ground sausage for us UK folk? Do you mean you squeeze the meat out of the sausage casings, or just chop up the sausages? Thanks! Hi Natalie! We get ground pork (just plain pork ground up like ground beef) and then season it ourselves – our farmer also sells ground pork already seasoned with sausage seasoning. If you cannot find something like that you could definitely cut the casing from a sausage link and cook it up! so I just made these and they puffed up like crazy in he oven and then totally deflated leaving big air holes in the bottom half of the egg muffin. Any thoughts as to what causes his??? Oh bummer! I make these all the time and never have an issue, but I did have one time that I used some different veggies and I didn’t pack stuff in as tight – like there was more air in there and they came out lighter and airier if that makes sense. Did you use the same veggies and meat as the recipe? How long would you say these would keep in the fridge? Would like to make and just have ready for the week or a couple days. Hi Heather! I don’t let them go more than 3 days in the fridge. They do freeze well. I like to plastic wrap them and then into a freezer bag. I hope that helps! Hi! Are you able to eat these from the freezer (first heating, obviously!) or do they need to be thawed before reheating? How do you reheat – microwave (how long/how high)? Oven – how long/hot)? Thank you! Hi Sarah! I have taken them right out of the freezer to the oven to warm up and they work. I don’t use a microwave so not sure on that time but I did the oven at 350 – actually I just put them in there cold and by the time the oven pre-heated to 350 – under 5 minutes once it was done preheating if I can remember correctly. I hope that helps! These are wonderful. We sub cut-up nitrate free Canadian bacon & they are delish!! Love your ideas! Hi Nicole! I’m so glad you enjoyed them! Is the baking powder a required ingredient? Please and thank you! Hi Alexis! Yes it is – it makes the muffins rise! 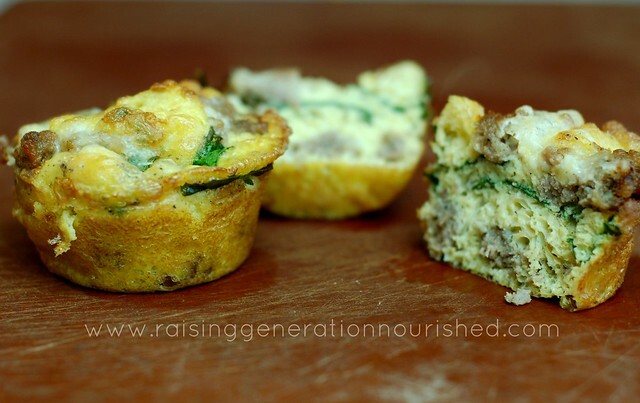 I tried these egg muffins without sausage. I used red bell pepper and spinach. They taste wonderful but they were stuck to the muffin pan! I used a lot of coconut oil to grease the pan! Your muffins look so perfect and neat! How did you do that? I am using a Nordicware aluminum muffin pan. Should I try with a non stick pan? Please help! Atleast half of each muffin was stuck and I had to scrape it off with spoon and it took me atleast half hour to clean up my 12 muffin pan! Please help me with any suggestions as I would like to make these once a week so I can use for my kindergartener! Hi Swarna! I do have a non-stick pan – I wonder if using silicone muffin cups would work though too? Can you use cupcake liners so it doesn’t stick in the muffin pan? Awesome Trisha! Gosh I think when I wrote this it was just the 2 girls as toddlers eating them – I definitely double up into a dozen pan now! What is the serving size? Is it one? I am planning for the 80 day obsession plan and am limited to my food intake.